Veranstaltungen aller Art sind nicht erlaubt. Ruhige Nachbarschaft. Quiet nach 10 Uhr. The Candy Kitchen Resort is beautiful and the manager, Colleen was exceptionally nice and accommodating. It had everything we needed to live and cook in the house. It is not only beautiful but very functional. There is internet, TV and a DVD player, an amazing stove and refrigerator, etc. The outside is also wonderful with a lovely yard and view with abundant wildlife. It is on the outskirts of East Glacier so you are out of town but able to get to shops and restaurants easily. It was a great location to explore the park from. We had a wonderful time and will treasure our stay at the Candy Kitchen Resort! We certainly enjoyed your visit! What bright and shining stars who will be graduating soon! The world celebrates them. And they are so fortunate to have such adventurous folks for chaperones! I am so glad to have met all of you! Thank you for your kind words. Our group of 10 friends loved our stay at the Candy Kitchen! Every detail has been thought out - more than enough towels for our big group, kitchen had everything we needed and more, plenty of room for our big group to sit and eat and hang out! Colleen is a warm and wonderful host. When we had trouble with the WiFi, she brought over her router for us to use. When one of our friends was not feeling well, Colleen brought her tea and checked on her during the day. Home is beautiful, amenities are amazing! We will always remember our fantastic stay at the Candy Kitchen! Thank you, Colleen! The story of how your group got together is wonderful! You all had such great attitudes and dove into the adventure we call Glacier Park. It was my pleasure to help out anyway I could. Thank you for your kind words. I am having a difficult time writing this review, because... My words can not do this place justice. We had 10 adults staying here for a family reunion, get together. Spending time together...and time in Glacier Park. We had a fabulous time doing both. This place couldn’t have been better. From the great location for visiting the east side of the park, to the well appointed home...The Candy Kitchen lacks for nothing. Even with 10 of us... this place was roomy, comfortable, and made it easy to “get along”. It was perfect for meals, entertaining, or just sitting around after a long day out hiking. Wonderful restful surroundings. Well appointed. Private. The Candy Kitchen is a beautiful, up dated historic log home, that made our reunion and Glacier trip one to remember. We could not have asked for more. Absolutely perfect. And now to our lovely host Colleen. This lady is adorable! Definitely a keeper. She is close enough to help out, or answer questions when needed... but honored our privacy. We even talked her into participating in a family prank! She was a trooper. Thank you Colleen. Thank you for the extra work it took, planning ahead, making adjustments, and during, our family reunion/get together. We are forever grateful. We Bradley’s will never forget our time together in Glacier. And our time at the Candy Kitchen. It was very hard for us to leave. We loved Connie! The house was awesome I would recommend staying here to everyone. The Candy Kitchen enjoyed hosting you and your group! You folks are awesome! Have a wonderful rest of your summer and hope to see you again! It is a beautifully renovated and maintained home. 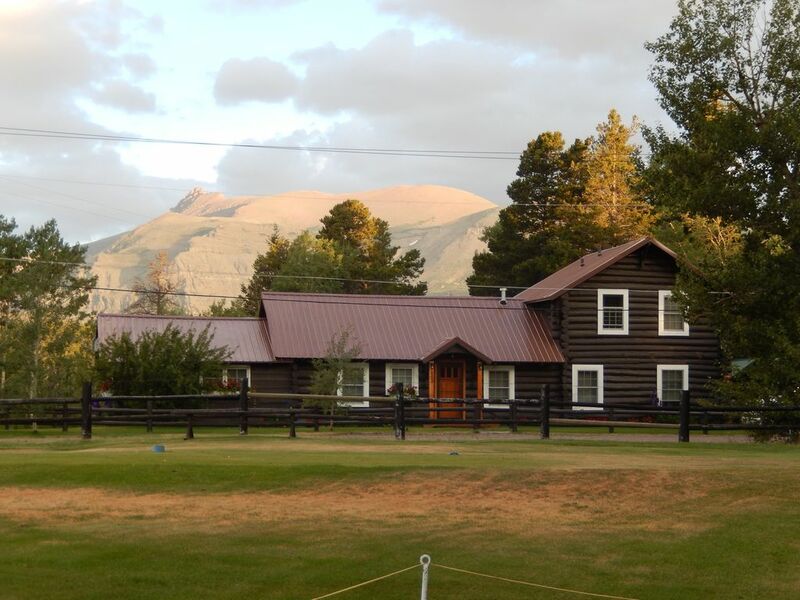 The house located just behind the East Glacier Lodge, is is perfectly situated to take advantage of all that Glacier National Park and its surroundings have to offer. The former Candy Kitchen for the Lodge and Great Northern Railroad,I believe, it has been beautifully renovated to capture the character of the time with all of the amenities of today. It is very well appointed from kitchen to the bathrooms. Colleen Erickson is wonderful and very helpful. We had a large extended family group of all ages and everyone wants to know when we are going back! A true vacation escape in a stunning setting. It was our pleasure! Your family was awesome (Nora's favorite word) and we look forward to your return! Thank you for your kind words! Beautiful! And within walking distance to Glacier Lodge and restaurants! This place is absolutely gorgeous.. with a beautiful history as well! Colleen was extremely helpful and friendly from the very first email and up to and including our visit. (Thank you Colleen!). The kitchen is very well stocked and orderly... It was very, very, very clean... (thanks Pierre!) Loved the little "niceties" which included a bottle of wine and Dr. Teals soap in the bathrooms! I cannot think of anything that was missed in this beautiful home. Thank you so much!!! Thank you so much for all your kind words. It was our pleasure to host your wonderful family! No referee needed there. Smile! We look forward to seeing you again for future vacations. Wenn Sie von Osten oder Westen kommen ... Wenn Sie auf der Autobahn 2 in die Stadt kommen, fahren Sie unter der RR-Unterführung auf den Highway 49. Sobald Sie die Lodge und den Golfplatz (ca. 1/2 Meile) vorbei gehen, nehmen Sie die erste Straße links Sie (Midvale Street) kommen, bevor Sie auf die Mountain Pine Motel-Zeichen zu erhalten. Diese Straße geht dann in 4th Avenue verlassen. Gehen Sie ca. 1 Block und es wird auf der rechten Seite an der Ecke sein. Es ist ein historisches zweistöckiges braunes Blockhaus mit einem Schild mit der Aufschrift "The Candy Kitchen"
************************************************** ******** Wenn Sie von Norden auf der Autobahn 49 kommen, fahren Sie am Mountain Pine Motel vorbei und biegen Sie rechts in die Midvale Street ab. Diese Straße dann auf 4th Avenue abbiegen. Gehen Sie ca. 1 Block und es wird auf der rechten Seite an der Ecke sein. Es ist ein historisches zweistöckiges braunes Blockhaus mit einem Schild mit der Aufschrift "The Candy Kitchen".